The Sounds of the Mother Tongue. A manual of Speech Training for VIIth Standards in Elementary Schools. Original blue cloth, lettered in gilt, gilt collection stamp to upper board, 74[i]pp., illustrated. Book a little shaken with Cape town University (Stuttaford Collection) labels and stamps in usual places. Clean and tight. ; First published in 1911. 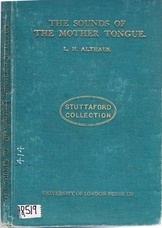 Althaus was familiar with William Tilly (Tilley) of the Institut Tilly in Germany, and many of the leading phoneticians in France and Britain at the time. 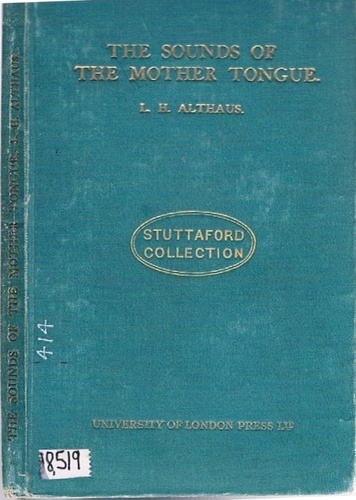 Her prefaces give useful information on methodology and the application of phonetics in the classroom. To that end, she cites Walter Rippmann (Ripman) from a meeting in London. Czech Self-Taught by the Natural Method with Phonetic Pronunciation.